(1) That all the exemptions which the Congregation of Discalced Augustinians of Italy enjoy, especially as regards subjection to the Prior General of the Order of Hermits of St. Augustine, may also be enjoyed by the Congregation of Spain and the Indies, since it is from the latter that the former took its origin towards the end of the XVI century, and since the way of life and the government of both are about the same. (2) That the Apostolic Letter Apostolici Muneris, issued in the form of a Brief on February 11, 1602, by Pope Clement VIII of happy memory, be considered abrogated in what concerns the visitation of the Discalced or Recollect Augustinians by the Most Reverend Prior General, and also the Brief Ad Sacram Beati Petri Sedem of Gregory XV (August 31, 1622) insofar as it refers to the same matter. (3) That the Vicar General of the Congregation of Spain and the Indies enjoy all the privileges which the Most Rev. Prior General enjoys over the sodalities and confraternities under the invocation of the saints of the Order of St. Augustine, and also that the Congregation might enjoy all the spiritual favors already granted or to be granted in the future to the Order of Hermits of St. Augustine. (4) That the Apostolic Letter Permulata, issued for the aforesaid Congregation on August 18, 1795, by Pius VI of holy memory, be regarded as abrogated, since the reasons for which it was issued no longer exist. Et Deus, etc. Fr. 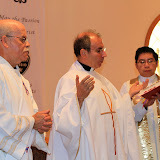 Miguel Miró visited between June and October most of the Augustinian Recollects working in Brazil, Guatemala, Colombia, Mexico and United States to explain the process of change being undertaken in the centuries-old Order. "How can we revitalize our charism? How will we approach the process? Why do we have to reorganize? How are we going to cope with the difficulties? Do we want change?" These are some of the questions the prior general had to discuss in his meetings with the religious. The General Chapter held towards the end of 2010 challenged all the Augustinian Recollects to make "a daring, oblative and passionate option", i.e., the option to abandon all material guarantees and be open to the initiatives of God by earnestly listening to his Word. October 13, 2011: Mater Dolorosa Passionist Retreat Center, Sierra Madre, California - The friars were privileged to greet Dr. Paul Ford, professor of systematic theology and music at St. John’s Seminary in Camarillo, California, as today’s lecturer on the use of the new Roman Missal effective November 27, the first Sunday of Advent. a lively sharing on the use of the New Roman Missal. This morning’s presentation’s central theme was, with the implementation of the new missal, “toward a deepening of the renewal.” Dr. Ford presented to each friar a self-composed detailed manual to the Missal which was used throughout the presentation. He stressed that although there are several changes in the new Missal, the main liturgical parts remain unchanged: the primacy of the Word, the priesthood of ALL people of God and the work of the Holy Spirit. October 12, 2011: Mater Dolorosa Passionist Retreat Center, Sierra Madre, California - Following the Liturgy of the Hours and a hearty breakfast, the religious gathered for today’s first conference from Father General, continuing the theme of the revitalization and restructure of the province. 1) How can we revitalize the Order’s charism? 2) How do we go about implementing a process of restructure? 3) What do we hope to achieve? 4) How do we cope with the difficulties that lie ahead? 5) Do we truly WANT to change? October 11, 2011: Mater Dolorosa Passionist Retreat Center, Sierra Madre, California - Why do we need to re-organize? How are going to do it? Who is going to do it? With these questions in mind, the 2011 St. Augustine Provincial Assembly had begun Monday afternoon: as Fr. General, Miguel Miro, began his discussion of the need for revitalization and restructuring of the Order. The day started with evening prayer and dinner on Monday evening, followed by the introductory conference given by Fr. General challenging the members of the Province to be open to the inspiration of the Holy Spirit in the restructuring of the Order in relation to the Word of God.